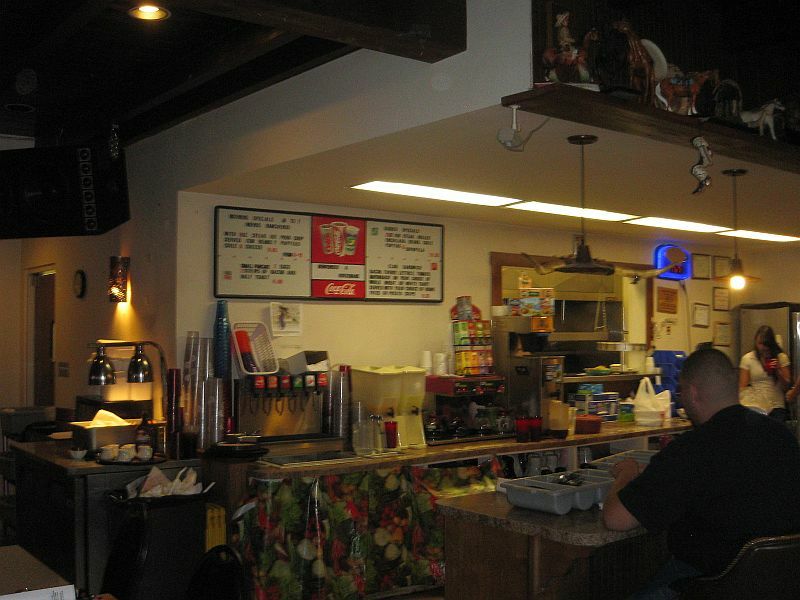 This excellent restaurant may have odd hours, but it is also a local favorite. The Haven has some of the best green chile in the entire state of New Mexico. Service is quick and friendly, and their prices are reasonable. 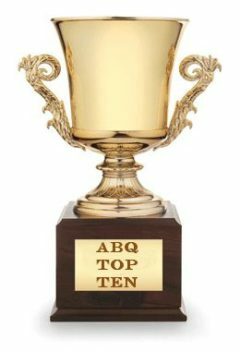 The level #2 green chile is not for the faint of heart, seriously, and some have deemed it as the hottest green chile in the entire southwest. You have to special order it with your meal. But I get ahead of myself. I have been on a Green Chile Cheeseburger quest since I came to New Mexico 3-1/2 years ago. I maintain a list of the top ten that I have found in my Hall of Fame page. 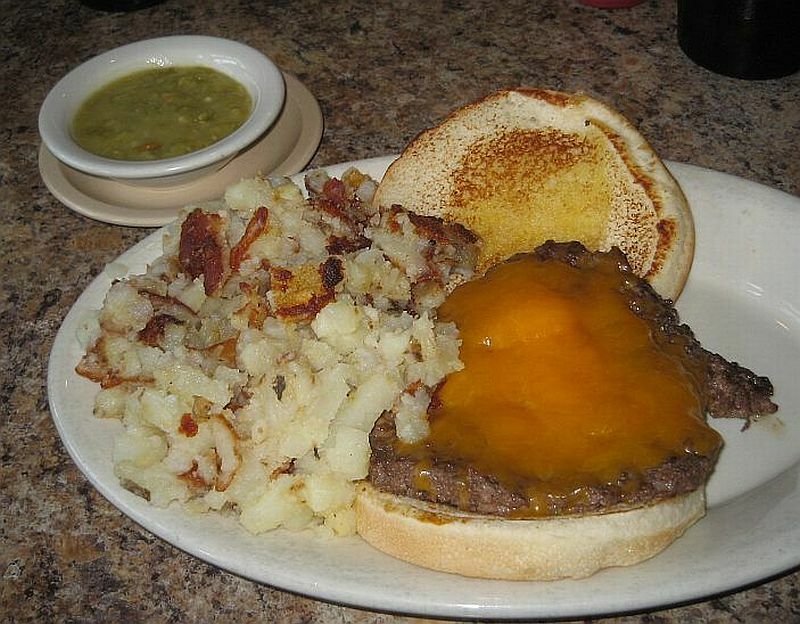 When I order a GCCB, I get it competition style —patty, cheese, green chile on a nondescript lightly toasted bun — so I can judge the taste and texture without salad on it and without mustard or ketchup (ugh) to adulterate it. Jane usually orders them straight off the menu, the way that the cooks present them. We compare notes. The level 2 half GCCB. Wow! I had been told by gastromomes whom I trust that the Haven makes a really great GCCB, so there we were one Saturday afternoon staring at two of the loveliest looking GCCB creations that I have seen. The beef is properly fatty and not dry, but quite moist without being greasy. These are hand-cut and hand0formed beef patties with a tantalizingly irregular shape. No cookie-cutter patties here, Bub. The cheese was properly gloppy (with almost stick-to-your-teeth consistency.) Bun was great, not yuppie style with some seeds baked onto the top. I ordered two small dishes of the Green for comparison and experimentation. The regular Green is very high on the piquancy scale, which may be too hot for most tourists and gringos. This I put on one half of the burger, and covered the other half with a mixture (half and half) of the regular and the legendary level 2 stuff. Both halves were fantastic, but then I am a chilehead. Jane stuck with the regular Green. A minor point—the Green, while very tasty, could have a slightly more smoky taste. 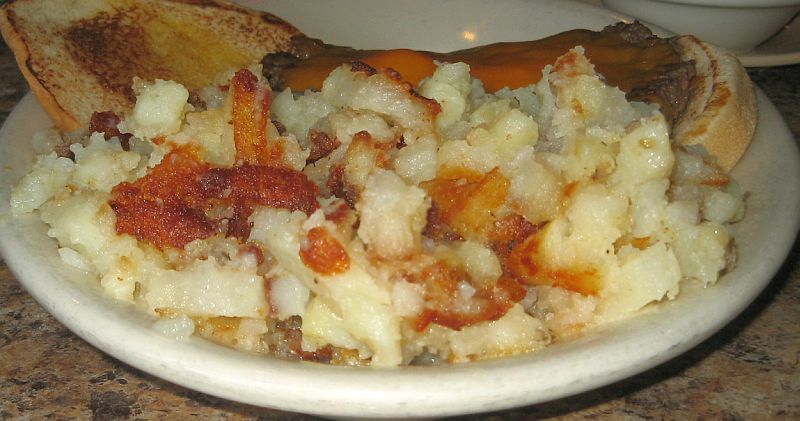 Both lunches were accompanied by a large pile of most delightful home fried potatos that were cooked to perfection. They were slightly crusty, and were probably the best that we have had in New Mexico. Almost worth a special trip from Corrales to Santa Fe. There may be those who think that eating really hot chile concoctions borders on the macho. Well, these folks don;t appreciate the beauties of properly prepared Green or Red. Get over it. It adds to and complements whatever it is served with. So there. The Haven serves many other delicious sounding (and looking) New Mexican dishes. Something for every taste. Maybe I’ll try them sometime. When I get my fill of the GCCBs, that is. 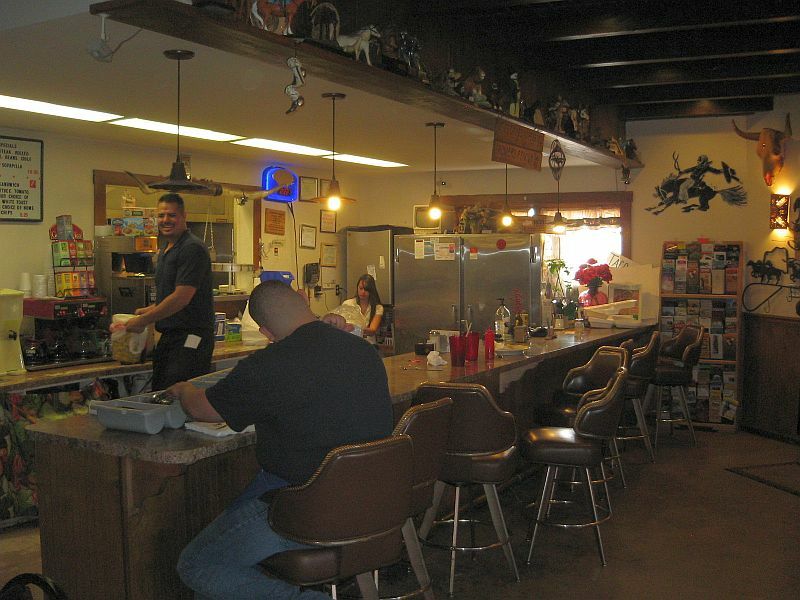 The room is truck-stop modern, and all the diners (mostly locals, I surmise) look happy. I know why. Go there and get happy. 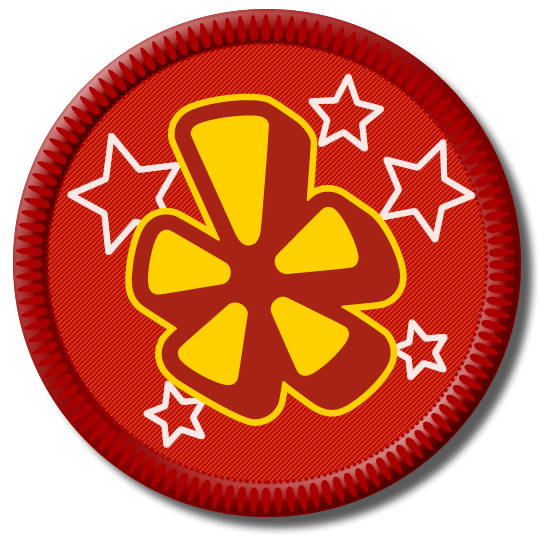 The Haven’s GCCB cracked my Hall of Fame, and is now my third favorite GCCB in New Mexico (therefore the universe). This entry was posted in Burgers, New Mexican, Santa Fe. Bookmark the permalink. 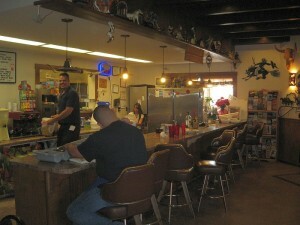 A few years ago, the good folks who own Horseman’s Haven opened up A Taste of Haven (http://nmgastronome.com/blog/?p=1024) in Rio Rancho. Sadly it closed within a couple of years. 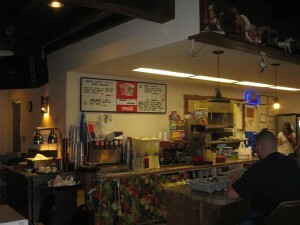 Fortunately those of us who consider pain to be a flavor can still get our chile fix on the outskirts of Santa Fe.